He's the reigning V8 Supercar champion and again the driver to beat in 2009. 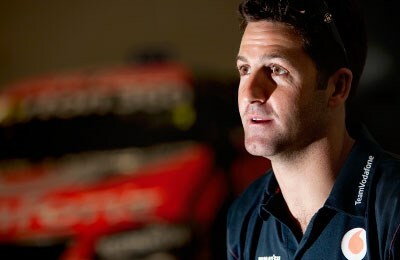 So why is Jamie Whincup already planning a move beyond motorsport? "I won't retire at 30. Whether I'll still be driving a racing car after 30 is another thing." And just like that Jamie Whincup changes this from a straightforward interview to something very different. Usually encounters with youthful racing drivers are heavy on cliché and short on real insight. You know the drill; young man in a hurry, a fierce will to win, God-given talent, devilish good looks and a string of beautiful women left panting in his wake. All these truisms may apply to Whincup. Some definitely do. But there's nothing orthodox or clichéd about his desire to hang up his helmet at 30 and find another life. Here's a guy who, in three and a half years at Triple Eight Race Engineering, has won three Bathursts, three Clipsals and is the defending V8 Supercar champion. In the course of achieving all this he has not only eclipsed the likes of Tander, Skaife, Ingall and the Kellys, but also his team-mate, Craig Lowndes, the modern-day icon of the sport. He is just 26 and to modify yet another cliché, surely has the motorsport world at his feet. For him to be contemplating life beyond the cockpit in just four years when his talent may not even be fully realised seems mind-boggling. Crazy even. Seeking a life change is understandable if you're an accountant, a journalist, or the spin doctor who advised Kevin Rudd to avoid the 'b' word. But surely, when you're as good at something as exciting and as lucrative as racing cars, you hang in there for all you're worth for as long as humanly possible? "Um." He starts explaining hesitantly. It's obvious he's reticent to really explore this, particularly with someone so sceptical. "Because there's a lot more to life than motorsport," he ventures. "It's something I live and breath; I'll always be involved in motorsport in some way ... but there's a lot out there. Hopefully I can look at this motorsport thing, tick that box and say 'hey that's the majority of my life'. "But there are other challenges out there which I'd love to..." he trails off, thinks, then tries again. "When I get to 60 and I'm old and my kids are wheeling me out in my wheelchair at the retirement village, hopefully I can say I've done a lot more than just won a V8 Supercar championship." There's a beguiling naivety to this statement as well as an intriguing depth. Naive because 60 isn't old anymore, something he will learn with time. Depth because there are few race drivers who, at least publicly, acknowledge a bigger picture than the track in front of them; that what they do isn't really important in the big scheme of things, no matter how important it is to them. At first meeting there's no hint of what's soon to be revealed. Whincup offers a friendly face, a firm handshake, a long-vowelled Aussie accent. But he soon veers from the Aussie-bloke norm, tending to be expansive and self-confident in his answers rather than monosyllabic. It's the manner of someone used to success, yet in our time together he doesn't cross the line into arrogance. People familiar with Whincup say he has become more assertive of late, but on the whole remains pretty well grounded for someone in such an elite position. Paradoxically, his appreciation of a wider life seems born from his time spent within racing's narrow literal and metaphorical confines. Father David and uncle Graeme spannered for Allan Moffat, Graeme was also a successful sports sedan racer in the days when the category had a profile. Jamie played in his uncle's race cars as a toddler and Dad bought him his first go-kart at seven. They progressed successfully from rookies to juniors to seniors and then into Formula Fords. The family funded Jamie's 2002 national championship-winning Formula Ford campaign with Sonic Motorsport. In the process he beat another young future superstar of V8s, Mark 'Frosty' Winterbottom. From there the story is well known; an unsuccessful but valuable learning year with Garry Rogers, a year in the wilderness, reborn at Tasman Motorsport in 2005 and then the transition to Ford with Triple Eight for 2006. "Dad is very competitive - he pumped 'just win at all costs' into me, and it continues," says Jamie of his formative days. "I don't really care about anything as long as I cross the line first, pretty much at all cost. "It's everything for me. It's an experience, a feeling that money can't buy. Standing on the top step of the podium knowing that everybody else has done the best job they could and you've beaten them. That feeling is better than anything." But Whincup has realised such highs don't come easily. Success is inextricably linked with hard work and dedication. As he depicts it, his life is stripped down to focus on his job. "I've learned that you can't be the best at everything," he explains. "My golf is ordinary even though I love the game. I love competing in sport but I can accept not being my best. But motor racing is what I put all my time into and I certainly don't expect not to be the best because that's what I dedicate all my time to." It's a theme that comes up again when the subject turns to his speed advantage over Craig Lowndes and why he thinks that has come about. "My advantage over him is my lack of outside influences," he says. "I just live in a little place down on Hope Island and race my car, where he has got plenty of other things going on in his life; kids, family. I can just dedicate more time than he can, that's all it is." While his life is no doubt more complex than he makes out, there is no doubting his focus. Triple Eight boss Roland Dane has publicly stated several times over the years that Whincup got the seat ahead of some of Australia's other best young talents because he was the one who showed the most hunger. Money simply wasn't an issue, it was an opportunity he wanted to devour. The 'problem' now - if you want to call it a problem - is that Whincup's hard work is netting results. It means the goals he has set himself in his racing career are being rapidly ticked off. And that's where a new future beckons, Once everything's been done, Whincup says he has no desire to simply hang around and race for the sake of it. "That's what motivates me, winning new fresh challenges. I know that if I do achieve what I have in Australia then those new challenges won't be there and I won't get the most out of myself, which scares me in a way. I want to keep it fresh, I need new challenges. I love what I have here; I don't want to leave it. But you only live once and there are plenty of other things in life that I want to explore." Whincup is talking in the context of making the shift to another racing category overseas, something he's never done and is reported to be considering for 2010. It's no coincidence that news stories quoting his manager on this subject have popped up when he's in the midst of contract negotiations. But later, when the subject of his departure from the sport at 30 comes into light, it's apparent those comments could apply just as appropriately to that scenario. So what are these other goals and ambitions he has to explore beyond the track? He won't say, just that an "urge" is driving him away from, well, driving. "The thing is, that urge is there, what it is won't be decided till I get to that point. What I want to do right now won't be what I want to do when I'm 30. I still have another three or four years which is a long time." No, actually it's not. It will pass like Whincup does on the track - quickly. It's incredible to think that if he sticks to his plan, five years from now he'll simply be a name in the record books. Albeit, a frequently printed name, judging by his current rate of success. "There's another three or four years of my driving career left and I want to make it successful," he says. "For me it was a great experience and hopefully the next one will be even better. Whatever that may be."